One thing I’m really going to miss when Oprah goes off the air are the peeks she gives us into celebrity homes. On Monday, we got a look inside the controversial $20 million “waterpark house” that Celine Dion and her husband René built on Jupiter Island. As I mentioned before, it’s been making waves with her neighbors. Gotta love how Celine let the cameras into her home while she was still in her pajamas and wearing no makeup. Everything is decorated in black and white. The rooms don’t look all that big considering the house has almost 10,000 square feet. The Daily Mail called it Celine’s “Big White Home” and questioned how practical it is to raise three boys in a house with so much white. I’m not too worried about it, though. I’m sure she has plenty of people willing to clean the furniture–or replace it for her–if need be. I’d be more concerned about the black rug than the white upholstery. Black rugs are notoriously difficult to keep clean because they show everything. Did you see Celine on Oprah? Are you a fan of hers? How about her black and white house? Celebrity Houses is the page where I list all of the ones I’ve featured so far, from Jennifer Lopez to Sandra Bullock. Enjoy your day, my dear friend. Wow, this is an amazing place to live. I especially like the big couch in the first picture, and I like the kitchen as well. I guess it is more of a play house than a treehouse. My daughter and her friends would love it! Oh, rats. I missed this on Oprah. I do like Celine. The house? Not so much. I like white, but that’s a LOT of white! I am a fan of Celine and I love the reasons that she built this house and the fact that she didn’t try to make it look flawless before the Oprah crew came over. But, the house just looks like a foam core model to me! lLike a mock-up just sitting there waiting to be replaced by a real house. The white is too stark and looks unfinished, imho. LOL on the black rugs. We put a brown and black background rug in our family room thinking it would be forgiving and our yellow lab sheds all over it and we vacuum a lot. It does hide the chocolate lab’s hair though! You nailed it with the “foam core model” statement. That’s exactly it! I knew there was something strange looking about the home, like it looked fake or something. Wow, that would be nice to have a back yard like this – particularly if you are a kid! I thought her home would be more warm and cosy. Nice though. Celine is a incredible woman…she is so generous, thoughtful and kind. The Lord has truly blessed her in every way! She is always thinking of others, just like this house for her family to vacation. It would not be my choice, but she can enjoy it for a season and then completely change it when she feels like it! Who can tell Celine no??? The house is a little too white for me. I like soft colors. Plus, I have 3 dogs and can’t imagine what they would do to white furniture. Not to mention James Bond and Indy! Ugh. I never get to see Oprah b/c of work but I was happy to catch this episode b/c of the holiday. I was pleasantly surprised to see that Celine is so sweet and down to earth! I also loved that this house is for her huge extended family to be together. I am not a huge fan of the all black and white decor but I think it suits her and they did it well. I don’t particularly like the black and white. I think it looks stark and a bit cold, especially for a Florida home. I agree about the black rugs. Such an impractical choice for frequently used rooms…no thanks, not for me. Celine must be so happy to have those darling twin boys. The only time I’d ever seen pictures of her house before was when you posted some several months ago. At the time, I was sort of disgusted. After seeing her on Oprah earlier this week, I sort of get it. I mean, NO ONE needs that kind of room, but I didn’t know how large their extended family is and how often they get together. We vacation with my husband’s extended family every summer at the beach, and we have to rent an 8-bedroom house for the 24 of us (11 adults and 13 kids). It’s very expensive, but we split it eight ways, so that helps. I feel safe saying that if any one of us were a multi-millionaire who could afford it, we would buy a large house on the beach with a huge pool so that we could accommodate our big family regularly without being crowded! Granted, it wouldn’t be as over-the-top as Celine’s house, but as a celebrity who MIGHT have lost touch with reality just a little bit, I get why she went “all out” with her house. I did not see that episode. Thanks for posting the shots. I have been wondering what the inside of the water park house looks like. I guess their reason for building it makes some sense, but I still think it was a bad idea. Great post Julia, thanks for the dose of Ms Dion! The home’s interior is a little stark for my tastes, but I have to give Celine two thumbs up for being real. I don’t know of any mom of baby twins who would wake up and wear a designer outfits with perfectly styled make up and hair on just any day. I think it’s cool and it shows moms that it’s okay to be imperfect sometimes. I LOVE the playhouse!!!! Love Celine and love her even more for being so down to earth while being filmed in her home. Love her house too but I would decorate the inside differently. I like the white but I would accessorize with lots of color. Ha…I’m surprised she didn’t manage to have a white trampoline (pictured in the aerial shot)! Just wanted to let you know I linked your post on Celine over at Reckless Bliss so more people will see her fabulous home! Not my thing but I admire her and am impressed that she let the camera crew shoot her in her casual at home no make up attire. I think she seems lovely and down to earth in her own way – just never understood his appeal. His appeal?…guessing a good man with a great brain and loving/lovable disposition. As in decor, traditional good qualities tend not to be a fad…or fade, and will last your lifetime. Lets just see how she’ll keep everything white with twin boys. love the jammies. she rocks! good for her with her beautiful resort home. i love it!! I feel like she always gets a lot of flack, but I have always liked her. As for the entire home being in black and white – not my fav but I do like it. not feeling the house at all – speaks more “I have too much money” I hate things that look so new & clean, no history or soul, all the white bugs me as well, love that she looks happy and comfortable with no make up on Oprah, you would of thought she would of had nannies all around plus a stylist, which I’m happy to see she doesn’t. All that wasted water is annoying as we’ll, that just looks ridiculous and the tree house looks staged…she definitely got the amazing voice gene over the interior gene, I’m just saying.. The black and white isn’t my style, especially in FLA, but I love that the kitchen/family room looks lived in. Notice the kleenex box and changing table! I so have problems with the water usage thing. Yes, they set up a system, but it’s still an outrageous use of water. That’s a good point about the end of Oprah’s show, I hope we’ll get to see glimpses of celebrity homes on some other show. I still remember her visit with Tom Cruise in Colorado-fascinating and awkward! I love black and white but this is too much for me, especially for a house of this size (10,000 sq feet?!). I love all the family photos, the rocking chairs, and that kitchen is pretty epic. I can only imagine the impracticality of black area rugs, no thanks! Great post Julia! I dunno, I’m a tad bit sick of the Floridian pastel so black and white is a nice change (I’m originally from South Florida). What I love about it though: the Mork and Mindy egg chair and all the baby things she has lying around. The swing, changing table, and the basket balls in the living room especially struck me as awesome. It kind of annoys me when people insist that their kids’ toys have to stay in one out of sight area. Your Welcome! Celine Dion’s twins are so cute. I am usually not a fan of black and white, but I actually like her house. Especially the yard. What’s great about this house is that it can easily be redecorated. The interior is so different than what I expected it to be. I pictured her place to be Mediterranean or something like that. Her white with black decor does not have that stark cold look that many ultra-modern homes of the two color mix with the predictable red accents, offers. 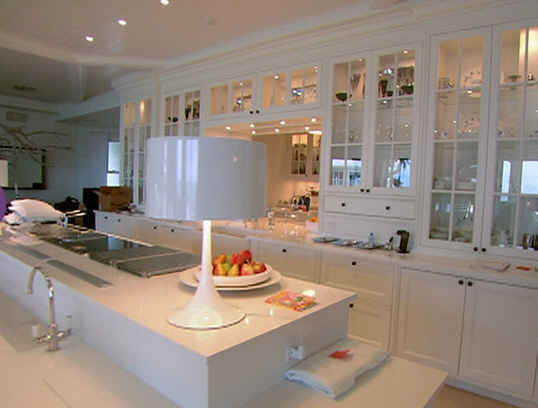 Instead you see subtleties in wooden banister, darker cabinet knobs, reflecting glass, moldings and other textures. Traditional & homey at the same time modern clean. I really like it. Do agree with carpet comment earlier. They are a bear to keep looking dark & clean! Got shedding dogs??? Forget the black including black labs! Thinking the room have much furniture and funny camera angles expressing smaller rooms than actually exists. She, like her house looks modern-clean & so happy!!!! Celine is very talented. 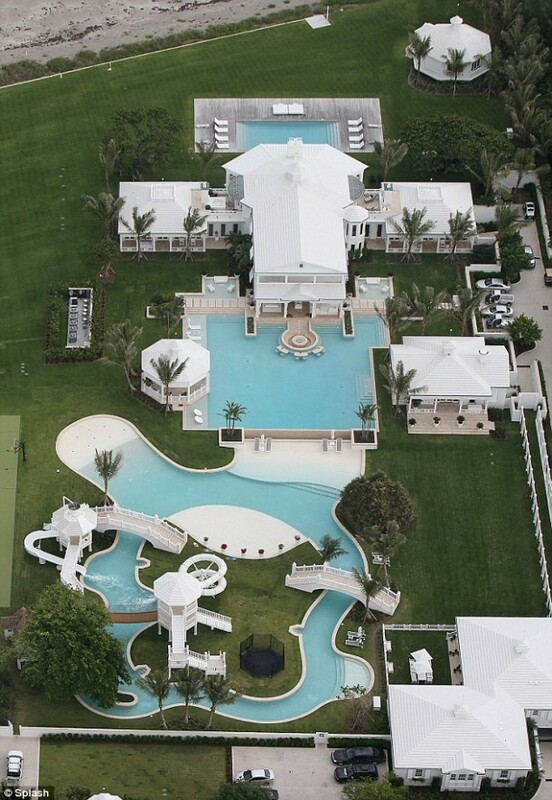 Wow…she does have a water park in her backyard! You are so right about black carpet, Julia. One of my neighbors has black carpet in the upstairs of her house (only carpet she has) and it never looks clean, even after her made has cleaned up there! Thanks for posting this! I would just worry about one of those babies drowning once they become mobile! My oh My!!. A bit ostentatious to say the least. I was in Jupiter in the summer where this house is located. Mind you I did not get a glimpse of it though. The driveways are pretty deep.Very beautiful area. Agree that the house is a little toooo white though. My house a is white too but I find I have to introduce color for contrast and interest. Those floors look like laminate and not hardwood, hopefully they are not. Otherwise love the playhouse . I am the unofficial president of the Celine Dion fan club! She is my all time favorite singer, & I hope to get to Las Vegas to see her during her 3 year stint there. I did see her on Oprah & the show was great. I have absolutely no problem with wealthy people spending their money exactly as they please (who’s telling us how to spend ours?). After all, they worked for it. Most of us would do the same. Celine appears to be so down to earth & concerned about others. I love the grounds & the house and how it actually looks lived in. If I lived there I would add some color at least in accents (pillows, etc.). All in all, however, the place rocks! Don’t care for Celine, Rene, OR their house. And I think it’s beyond belief that they so selfishly use all that water just for themselves when freshwater is becoming more and more scarce in Florida, and in fact, the world. Let the families go to the beach if need be. I just think it’s 100% inexcusable. Not to follow the crowd but I too love Celine’s being real in front of the cameras. No make up, in her jammies….hey that’s real life with babies no matter if it’s one or more! Not crazy about her house but I am sure she as a daily cleaning crew and she doesn’t worry about ‘stuff’ being on the black carpet! I remember her HELLO spread when her first son was born where she dressed in 4 inch heels for “new mommy around the house” photos so this was an improvement. However, I still can’t believe that she named those two little boys “Nelson” and “Eddy.” Really, really tacky. She said Nelson was named after Mandela. Eddy was named after another one of her heroes, but I forget who. Does anyone remember? All I can think of is the old time singer “Nelson Eddy.” I hope there is something deeper behind naming them with those two monikers. Hi Julia lets just say you rock… We get oprah here maybe a few months after you guys so thank you for this blog. I am a big fan. Do you think Eddy is short for Edmond? which sounds much nicer… I used to have a chocolate coloured rug beautiful but a killer to keep clean. The jury is out on the black and white. Till next time regards Esther from Sydney. It’s in Florida but for some reason it feels Vegasy. Maybe it’s because I live in the desert, but the thought of consuming 6.5 million gallons of fresh water per year just for a pool seems completely ridiculous. I usually believe that one does with one’s money is really nobody else’s business, but to consume a precious resource so greedily, just because one can afford it, seems so wrong to me. Isn’t her beach private? I have two young boys who can spend an entire day entertaining themselves at a beach with nothing more than a few pales and shovels and a boogie board. Couldn’t her family (even large extended family) entertain themselves on the private beach and in a normal, olympic-sized pool with a slide? I agree with Julie 333w–I would be so petrified of my babies drowning in all those different pools! Another celeb with a personality missing in the house. Weird. I once had an oppt. to buy an all black and white house and didn’t because of its coldness. I think Celine is one of the nicest people. How could you be upset with her? She has a fabulous home and she wanted other people to be able to come and enjoy. As for black and white: I think we should have the home we want and I’m sure she does. love Celine fan from way back in the 80s. Wonder if she went black and white becuase her Vegas home had more color to it so it might be a break from another design.. It’s too stark for me but I wonder if all of the activity the house sees with family makes up for the lack of color and just allows them to relax..
That tree house is so gorgeous, I would like to live in it. The water features are beautiful, although not Eco-friendly. Wouldn’t mind spending the summer there though! I watched the show about this home on Oprah. It was meant for her extended family to visit and enjoy. The house is beautiful. Looks good but hey where are the water slides. If I had the money to build that many ponds around my house I’d be building some waterslides too. I love you Celine Dion. You are my role model in many ways. I have always wanted to become a famous singer like you but I am scared to sing in front of people. I have been trying to overcome my fear by singing in front of people. I first started singing when I was 4 or 5. My brother said I sounded like a broken record, I probably did, but I never gave up on my hope it is still there. I listen to your CD’s all the time when I get to. My favorite song by you is “My Heart Will Go On”. I have also doing Bible Drill, you probably don’t know what that is. What you do is, 1st your in a youth or children group, then they will give you a packet to study the Bible scripture you have Quotation verses,Bible answers verses, scripture finding, and key passages. The youth has 8 seconds to find the scripture and step out and children’s has 10 seconds to step out. I am in the youth, I go to Brookhaven High School, in the 10th grade, I am 17 almost 18 in 2 months. I live for God and I am a believer of him. Today I am going to state drills in Bible Drills and this will be my first time in it. If you have any questions please contact me. Thanks for reading this. God Bless You.